Taking codeine/promethazine with other medications that may also cause drowsiness or breathing problems may increase your risk of very serious side effects, including death. To lower your risk, your doctor should have you take the smallest dose of codeine/promethazine that works, and take it for the shortest possible time. See also Drug Interactions section. Get medical help right away if any of these very serious side effects occur: slow/shallow breathing, unusual lightheadedness, severe drowsiness/dizziness, difficulty waking up. 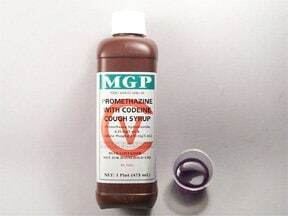 Who should not take Promethazine-Codeine? This combination medication is used to treat symptoms caused by the common cold, flu, allergies, or other breathing illnesses (e.g., sinusitis, bronchitis). 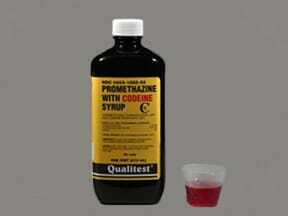 Promethazine is an antihistamine that relieves watery eyes, itchy eyes/nose/throat, runny nose, and sneezing. 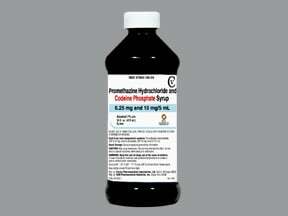 Codeine is a narcotic cough suppressant (antitussive) that affects a certain part of the brain, reducing the urge to cough. Cough-and-cold products have not been shown to be safe or effective in children younger than 6 years. Ask your doctor or pharmacist for more details about using your product safely. Read the Medication Guide provided by your pharmacist before you start taking codeine/promethazine and each time you get a refill. If you have any questions, ask your doctor or pharmacist. This medication may cause withdrawal reactions, especially if it has been used regularly for a long time or in high doses. In such cases, withdrawal symptoms (such as anxiety, restlessness, sweating, shaking chills, nausea, vomiting, and diarrhea) may occur if you suddenly stop using this medication. To prevent withdrawal reactions, your doctor may reduce your dose gradually. Consult your doctor or pharmacist for more details, and report any withdrawal reactions right away. 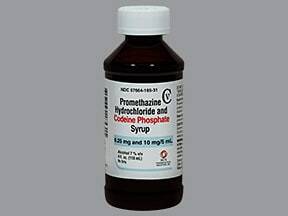 What conditions does Promethazine-Codeine treat? Drowsiness, dizziness, headache, lightheadedness, blurred vision, upset stomach, nausea, constipation, or dry mouth may occur. If any of these effects persist or worsen, tell your doctor or pharmacist promptly. This medication can dry up and thicken mucus in your lungs, making it more difficult to breathe and clear your lungs. To help prevent this effect, drink plenty of fluids unless otherwise directed by your doctor. Tell your doctor right away if any of these unlikely but serious side effects occur: involuntary behaviors/movements (e.g., fixed upward stare, neck twisting, tongue movements), mental/mood changes (e.g., hallucinations, confusion), ringing in the ears, shaking (tremors), trouble urinating, weakness. Seek immediate medical attention if any of these rare but very serious side effects occur: easy bruising/bleeding, slow heartbeat, persistent nausea/vomiting, severe abdominal pain, yellowing eyes/skin, seizure. Codeine is changed into a strong narcotic drug (morphine) in your body. In some people, this change happens faster and more completely than usual, which increases the risk of very seriousside effects. Get medical help right away if you notice any of the following: slow/shallow breathing, severe drowsiness/difficulty waking up, confusion. 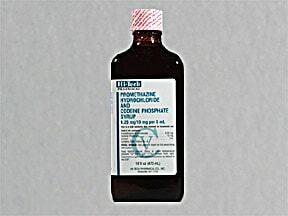 List Promethazine-Codeine side effects by likelihood and severity. Before taking this medication, tell your doctor or pharmacist if you are allergic to any of its ingredients; or to narcotic pain relievers (e.g., morphine); or if you have any other allergies. This product may contain inactive ingredients, which can cause allergic reactions or other problems. Talk to your pharmacist for more details. Before using this medication, tell your doctor or pharmacist your medical history, especially of: abdominal problems (e.g., chronic constipation, ileus, pancreatitis), gallbladder disease, adrenal gland problem (e.g., Addison's disease), blood/immune system problems (e.g., bone marrow depression), brain disorders (e.g., seizures, head injury, tumor, increased intracranial pressure), breathing problems (e.g., asthma, emphysema, sleep apnea), diabetes, glaucoma, heart problems (e.g., angina, irregular heartbeat), high blood pressure, liver disease, mental/mood problems (e.g., depression, psychosis), obesity, a certain spinal problem (kyphoscoliosis), stomach/intestinal problems (e.g., ulcers, blockage), thyroid disease, trouble urinating (e.g., due to enlarged prostate or urethral stricture), personal or family history of a substance use disorder (such as overuse of or addiction to drugs/alcohol). This medication may contain sugar and/or alcohol. Caution is advised if you have diabetes, alcohol dependence, or liver disease. Ask your doctor or pharmacist about using this product safely. Older adults may be more sensitive to the side effects of this drug, especially confusion, dizziness, drowsiness, constipation, trouble urinating, and slow/shallow breathing. Confusion, dizziness, and drowsiness can increase the risk of falling. What should I know regarding pregnancy, nursing and administering Promethazine-Codeine to children or the elderly? Some products that may interact with this drug include: antihistamines applied to the skin (such as diphenhydramine cream, ointment, spray), cimetidine, metoclopramide, naltrexone. The risk of serious side effects (such as slow/shallow breathing, severe drowsiness/dizziness) may be increased if this medication is taken with other products that may also cause drowsiness or breathing problems. Tell your doctor or pharmacist if you are taking other products such as other opioid pain or cough relievers (such as morphine, hydrocodone), alcohol, marijuana, drugs for sleep or anxiety (such as alprazolam, lorazepam, zolpidem), muscle relaxants (such as carisoprodol, cyclobenzaprine), or other antihistamines (such as cetirizine, diphenhydramine). Other medications can affect the removal of codeine/promethazine from your body, which may affect how codeine/promethazine works. Examples include azole antifungals (such as ketoconazole), bupropion, fluoxetine, macrolide antibiotics (such as erythromycin), HIV medications (such as ritonavir), paroxetine, quinidine, rifamycins (such as rifabutin, rifampin), certain drugs used to treat seizures (such as carbamazepine, phenytoin), among others. This medication may interfere with certain laboratory tests (e.g., some pregnancy tests, blood sugar tests, amylase/lipase levels), possibly causing false test results. Make sure laboratory personnel and all your doctors know you use this drug. Does Promethazine-Codeine interact with other medications? Should I avoid certain foods while taking Promethazine-Codeine? If someone has overdosed and has serious symptoms such as passing out or trouble breathing, call 911. Otherwise, call a poison control center right away. US residents can call their local poison control center at 1-800-222-1222. Canada residents can call a provincial poison control center. Symptoms of overdose may include: confusion, cold/clammy skin, fast/slow/irregular heartbeat, slow/shallow breathing, seizures, fainting, coma. Are you considering switching to Promethazine-Codeine? How long have you been taking Promethazine-Codeine?